If you were to arrange your closet from casual to ultra-fancy, T-shirts would fit in somewhere very close to the casual end. However, learning how to dress up a T-shirt is a skill that everyone should master. As our perceptions change about what constitutes as workwear or party clothes, the humble T-shirt has emerged as a comfortable, versatile piece that can easily be incorporated into multiple outfits. Below we're highlighting 11 simple ways to wear a T-shirt while still looking put together. From simple shirt-and-skirt combinations to more complicated layering tricks, these styling ideas run the gamut. While each ensemble is plenty polished, they all rely on a T-shirt for that extra infusion of cool. Clearly, this staple is worthy of much more than just wearing to sleep or to the gym. Read on to see 11 of our favorite ways to dress up a T-shirt, and then shop the tees we love. Pair a simple T-shirt with a polished plaid skirt and statement shoes. Layer a white tee under a bustier top. Throw a blazer on over a statement tee. Layer a T-shirt under your favorite fancy dress. Tuck a plain tank top into a pair of high-waisted pants. Style a worn-in T-shirt with a cool miniskirt and ankle boots. Wear your T-shirt untucked over trousers. 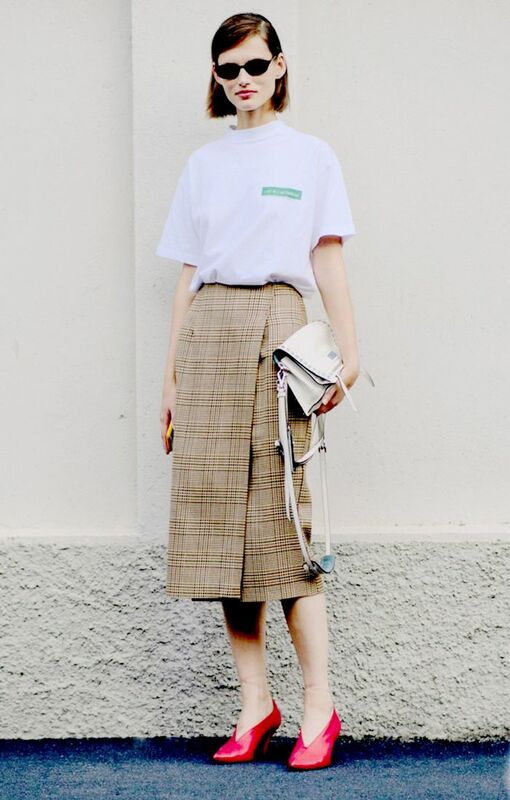 Wear your favorite sneakers with a T-shirt and contrasting skirt. Add a T-shirt to your suit set for a casual-cool feel. Try color coordination for a polished look. Style a classic white tee with jeans and heels (and a red lip for good measure). Next up: Check out the five-piece NYC summer wardrobe!